By Wednesday evening, a day after it ignited in San Bernardino County brush left bone dry by years of drought, the so-called Blue Cut Fire had blackened more than 25,000 acres in San Bernardino County and was four percent contained, firefighters said, revising an earlier estimate of more than 30,000 acres. 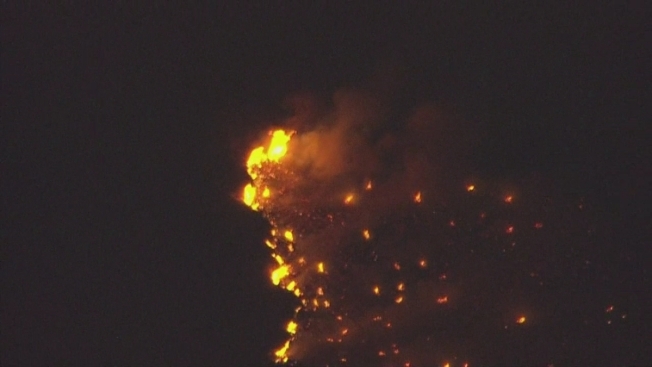 The flames advanced despite the efforts of 1,300 firefighters. The fast-moving blaze forced Interstate 15 to shut down in both directions, leaving drivers to find alternates routes through the region Wednesday morning as the wildfire continued to grow. By Wednesday evening, the 215/15 northbound connector was to reopen by 10:15 p.m. After the connector was to reopen, the northbound Interstate 15 that travels through the Cajon Pass was also to be fully reopened. At a morning news conference, authorities said the fire grew from 28 square miles late Tuesday to more than 46 square miles by Wednesday morning with no containment. Interstate 15 remains closed in both directions through the Cajon Pass, and State Route 138 is closed from State Route 2 to Interstate 15. Multiple school districts in the area were closed due to poor air quality and tens of thousands of resident were evacuated. "It hit hard. It hit fast," Hartwig said. "It hit with an intensity that we hadn't seen before." Crews battled the destructive blaze through the night after it charred more than 28 square miles Tuesday alone, forcing the closure of the Cajon Pass, and burning structures with no end in sight. The devastating blaze came as a punishing summer heat wave swept across Southern California, which is enduring its fifth consecutive year of drought and in the midst of one of its worst-ever fire seasons. Less than 24 hours after the blaze began 60 miles east of Los Angeles, the fire command assembled a fleet of 10 air tankers, 15 helicopters and an army of 1,300 firefighters, many of them just off the lines of a wildfire that burned for 10 days just to the east. At a dawn briefing, half the firefighters raised their hands when an official asked how many had just come from the earlier blaze, part of a siege of wildland infernos up and down California this year. Big rigs were parked on both sides of the pass, a major highway and rail corridor through mountain ranges that separate Southern California's major population centers from the Mojave Desert to the north. Hwy 138 closed between County Line to Highway173. Hwy 38 to Lone Pine Canyon has been closed.